dbw - dirtbikeworld.net Members Forums > Rider Organisations > Charity &/or Fundraiser Rides!! 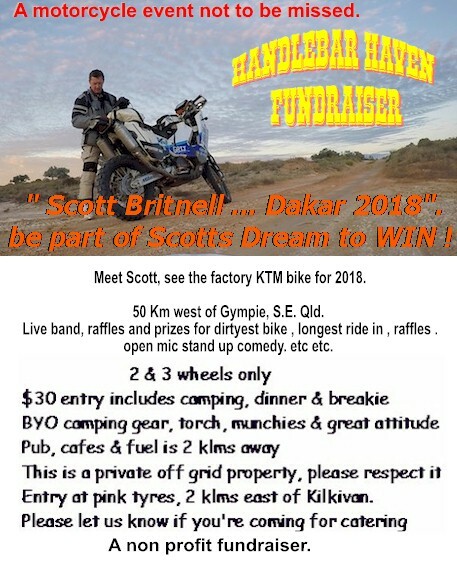 4 Feb FUND RAISER for Scott Britnell's 2018 Dakar Entry. Charity &/or Fundraiser Rides!! Rides that benefit more people than just the riders!!!!! Hello all, we are holding a fund raiser on the 4th of feb to help Scott get to the 2018 dakar. at our motorcycle only free camping area 2 km east of Kilkivan S.E. Qld. Scott will be here and also he will have the latst KTM factory bike with him. The flyer has most of the details on it , please share it far and wide.